A common problem about centralized messaging solutions is the sharing of sensitive information during day by day use, preserving, at the same time, message integrity and privacy. Sometimes two parties may need to share some information that is confidential and should not be accessed by a third party. Conversations may be exposed to third parties, for example, in case of account compromise or by storing Slack backups insecurely. How many users share passwords directly via Slack private messages? I hope just a few, but the sad truth is... probably many. Automatic notices to employees will be discontinued. The employer will now decide whether users will be told their conversations are being exported. Employers may decide to not inform users about conversation export; therefore company Slack users may not be informed of the export with a result of not being alerted of the potential data exposure. Even if this feature could have its benefits, it could also be abused by a malicious third party to access conversations without alerting company users. 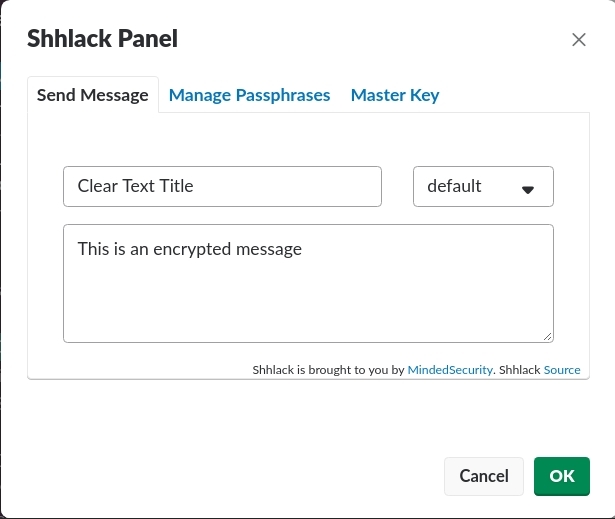 Summing up the latter news and our previous concerns about centralized storage of sensitive information, we decided to create something on top of Slack in order to add per message encryption via pre shared keys, that's why Shhlack was created. 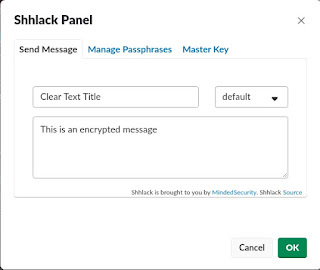 Shhlack: Welcome to the era of encrypted Slack! Shhlack is an extension for Slack and brings end-to-end encrypted messages in Slack workspaces. Shhlack is not a Slack bot. Instead it injects itself in the Slack web UI and uses Slack internal client APIs to encrypt/decrypt messages on the fly by choosing a passphrase from a set of stored keys owned by the user using cryptojs.AES JS library. It supports the usage of multiple keys, meaning that a user can have more than one key that can be shared with other users. At the moment Shhlack relies on pre-shared keys that need to be exchanged between users to get the ability to send and receive encrypted messages. To facilitate PSK exchanging it is possible to import/export the keys as base64 encoded JSON object. finally the super secret message can be written and sent. Slack servers won't see anything in clear text, nor Slack Bots. Only users - and bots - owning the correct PSK will be able to get the unencrypted content. Use of browser WebCrypto features to encrypt the PSK set on the client itself with a secret masterkey. Enjoy Shhlack and experiment as much as you want! We'll be looking forward to get your feedback. While testing the VRView web application we discovered a DOM Based Cross-Site Scripting Vulnerability in the handling of errors through an inappropriate use of the "innerHTML" property. The use of this property must be combined with the encoding of the data before it is used for data assignment, and in this case it wasn't used safely. Since the vulnerability also affects two of the most used Wordpress vrview plugins, an attacker could take control of the remote system that uses these plugins through a code analysis, or through automated tools. Depending on the type of vulnerability and the role of the vulnerable component within the system, it can lead to trivial effects on the complete ownership of the server and the compromise of any data contained in it. The aspect to always keep in mind is that for the execution of the external components the principle of the minimum privilege is almost never applied. Vrview is a library developed by Google for embedding immersive media into traditional websites. VR view allows you to embed 360 degree VR media into websites on desktop and mobile, and native apps on Android and iOS. This technology is designed to enable developers of traditional apps to enhance the apps with immersive content. For example, VR view makes it easy for a travel app to provide viewers with an underwater scuba diving tour as they plan a vacation or for a home builder to take prospective buyers on a virtual walk-through before the home is built. The vulnerability lies in the management of library errors, in fact, if it is specified through URL parameters: url or image, a nonexistent resource, the library returns an error including in the error message the resource specified in the request without executing the output encoding . The links below shows the vulnerability in real world example, the vulnerability includes other sub/domains that have not been mentioned such as "storage.googleapis.com". Please note that the links above contains a patched version of the library. Following are the two vulnerable Wordpress plugins found during the vulnerability analysis. VRView makes it easy to embedd Googles VRView into your WordPress installation. Embed 360° Videos and VR Videos as Well as panorama photos into your WordPress-Installation. Google VRP panel has decided to reward with a high reward as the vulnerability is included not only in sandboxed domains but also google.com. Vulnerability Found and Reported by Federico Fazzi.